Lucinda Hawksley will be talking about her new book, March, Women, March, which traces the voices of the women's movement in Britain, from Mary Wollstonecraft in the 18th century through to the "Flapper Election" of 1929, when all adult women were finally permitted to vote. As well as the famous names March, Women, March also recalls the many brilliant campaigners whose names have been forgotten over the years. Come and hear the witty, inspirational and shocking stories of how the vote was won. Lucinda became interested in the history of women's movement while researching the lives of 19th-century female artists. Her biographies include Lizzie Siddal, The Tragedy of a Pre-Raphaelite Supermodel; Katey, the Life and Loves of Dickens' Artist Daughter and Charles Dickens. In November she will publish a biography of one of Kensington's most famous and artistic residents, the sculptor Princess Louise. 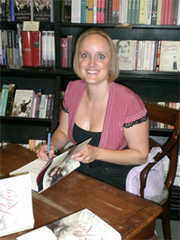 Lucinda Hawksley is currently considered a "single author." If one or more works are by a distinct, homonymous authors, go ahead and split the author. Lucinda Hawksley is composed of 5 names. You can examine and separate out names.